Turkey’s bid to join the European Union has lent new urgency to the issue of the Armenian Genocide as differing interpretations of the genocide are proving to be a major reason for the delay of the its accession. 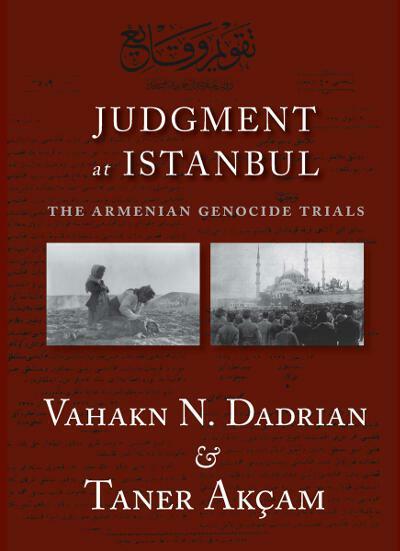 This book provides vital background information and is a prime source of legal evidence and authentic Turkish eyewitness testimony of the intent and the crime of genocide against the Armenians. After a long and painstaking effort, the authors, one an Armenian, the other a Turk, generally recognized as the foremost experts on the Armenian Genocide, have prepared a new, authoritative translation and detailed analysis of the Takvim-i Vekâyi, the official Ottoman Government record of the Turkish Military Tribunals concerning the crimes committed against the Armenians during World War I. The authors have compiled the documentation of the trial proceedings for the first time in English and situated them within their historical and legal context. These documents show that Wartime Cabinet ministers, Young Turk party leaders, and a number of others inculpated in these crimes were court-martialed by the Turkish Military Tribunals in the years immediately following World War I. Most were found guilty and received sentences ranging from prison with hard labor to death. In remarkable contrast to Nuremberg, the Turkish Military Tribunals were conducted solely on the basis of existing Ottoman domestic penal codes. This substitution of a national for an international criminal court stands in history as a unique initiative of national self-condemnation. This compilation is significantly enhanced by an extensive analysis of the historical background, political nature and legal implications of the criminal prosecution of the twentieth century’s first state-sponsored crime of genocide. Vahakn N. Dadrian was director of a large Genocide Study Project with sustained support by the National Science Foundation and the H. F. Guggenheim Foundation. The project’s first major achievement was the publication of an extensive volume, The History of the Armenian Genocide: Ethnic Conflict from the Balkans to Anatolia to the Caucasus (Berghahn Books 1995), now in its 8th edition, which has been translated into Arabic, French, Greek, Italian, Russian, Spanish and Turkish. In 2005, he received four separate awards for his lifetime contribution to genocide studies. He taught at the State University of New York (SUNY) system (1970–1991) and has been Director of Genocide Research at the Zoryan Institute since 1999.